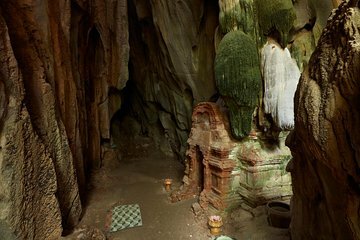 The landscape between Kep and Kampot is dotted with lush jungle limestone mountains, many of which contain hidden caves and charming Buddhist Shrines. Among these mountains lies a man-made lake which was built by hand during the Khmer Rouge regime. As this lake was well hidden from view, and away from the main roads, it is referred to as the ‘Secret Lake’. The lake’s bird life and natural beauty and the picturesque rural surrounds contrast sharply with its dark origins. This is an ideal trip for those who appreciate the beauty of nature and also enjoy learning about ancient and recent local history.